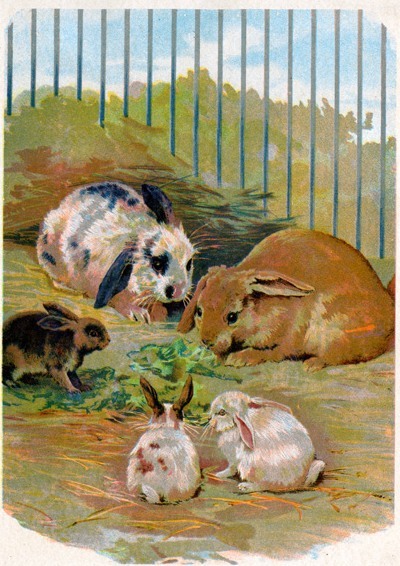 A great vintage colored drawing of rabbits in a hutch. Two adult rabbits and three young ones make this quite a sweet little drawing. All of the bunnies in this picture could easily be separated from the others to be used alone. When this book was published around 1880, the Charles E. Graham publishing company did not identify an illustrator or even an author for this work. It is such a shame that the artist, or artists, who gave us so many wonderful animal images was not publicly given credit for illustrating Animal Pets.